Mary Uppington Faucett (Alexander Hamilton’s grandmother) and her daughter Rachel Faucett (Hamilton’s mother) moved from Nevis to St. Croix in 1745. Rachel Faucett soon married John Michael Lavien and went to live with him on his No. 12 Company’s Quarter plantation. But where did Mary Faucett live on St. Croix? 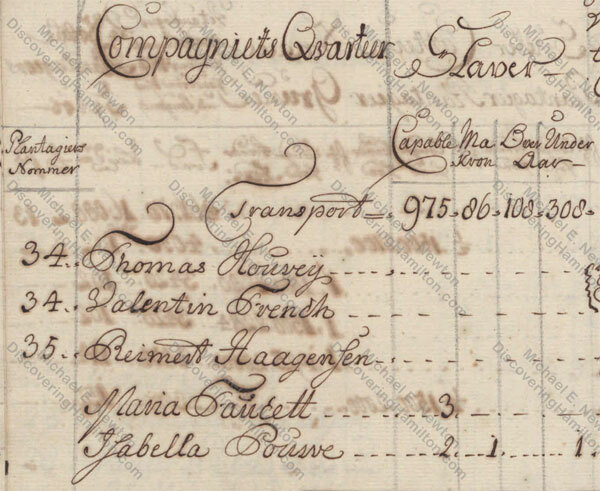 According to every matrikel from 1745 to 1749, covering her entire time on St. Croix, Mary Faucett lived in Company’s Quarter. The matrikel of 1745 states that “Maria Facet boer paa James Lyttons land” or “Mary Faucett lived on James Lytton’s land,” i.e., No. 9 Company’s Quarter. It will be recalled that James Lytton’s wife was Ann Faucett, either the daughter or step-daughter of Mary Faucett. The matrikels for 1746 to 1749 all show Mary Faucett living in Company’s Quarter, but they fail to provide a more precise location. One assumes that Mary Faucett continued to live on James Lytton’s plantation during these years. This, however, is not certain and it is possible she resided part of the time with her daughter Rachel and her husband John Michael Lavien at No. 12 Company’s Quarter. Living with Town Captain Bertram Pieter de Nully? Mary Faucet certainly did not live with Town Captain Bertram Pieter de Nully. As I pointed out last week, Bertram Pieter de Nully did not own any plantations in Company’s Quarter until 1756 or early 1757. 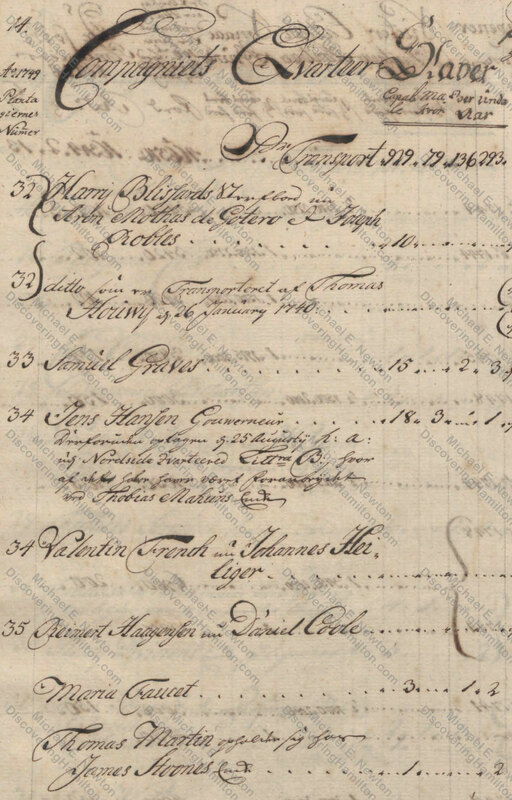 As Mary Faucett lived in Company’s Quarter while on St. Croix and left the island in 1750, long before de Nully purchased his Company’s Quarter plantations, she never could have lived with de Nully at Catharine’s Rest. 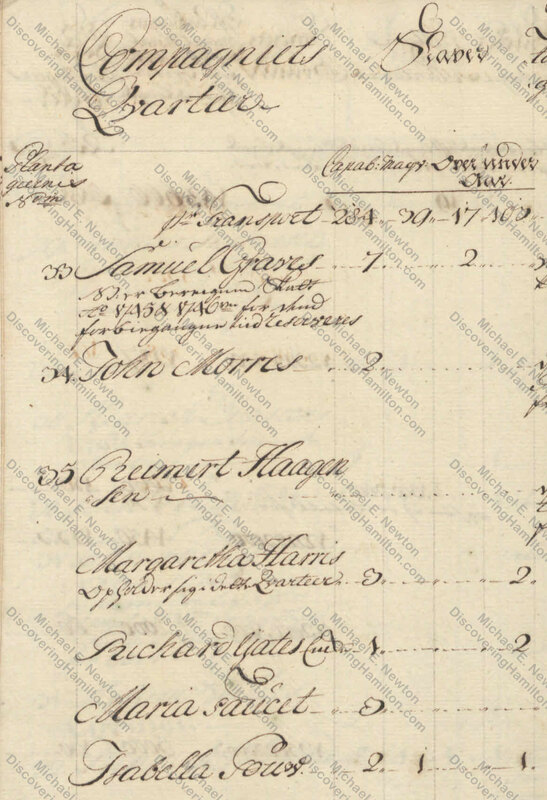 Moreover, as also pointed out last week, Bertram Pieter de Nully probably was not town captain when Mary Faucett lived on St. Croix, the earliest known record of him having that title being in 1757. Where did Mary Faucett live on St. Croix? It is thus clear that Mary Faucett lived with James and Ann Lytton at No. 9 Company’s Quarter when the 1745 matrikel was compiled in late 1745 or early 1746 and that she continued to live in Company’s Quarter for the following four years until her departure from St. Croix in 1750. It is also quite clear that Mary Faucett never lived with Town Captain Bertram Pieter de Nully, who probably was not a town captain when Mary lived on St. Croix and who definitely owned no plantations in Company’s Quarter when Mary lived there. 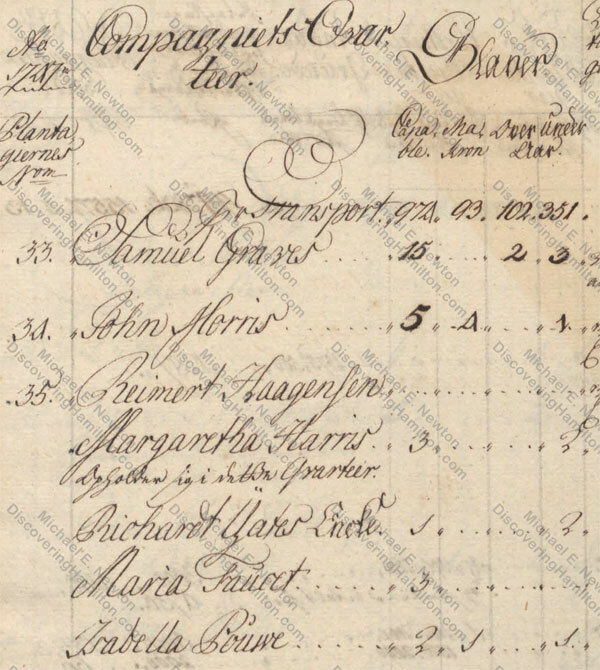 Mary Faucett’s location from early 1746 until her departure in 1750 thus remains uncertain, but she probably continued to live with James and Ann Lytton at No. 9 Company’s Quarter, though it is possible she also spent some time living with John and Rachel Lavien at No. 12 Company’s Quarter. Mitchell, Alexander Hamilton: Youth to Maturity 8. Flexner, The Young Hamilton 14. © Posted on August 6, 2018, by Michael E. Newton. Please cite this blog post when writing about these new discoveries.